Hospital-based specialty care, community health center-based primary care, and peer support - a winning formula for integrated care in Shanghai. A community health worker and a promotora de salud in Chicago provide peer support to African Americans and Latinos living with type 2 diabetes. Support from “people like me” is a powerful tool for managing health. It improves health outcomes, quality of life, and costs associated with health care. 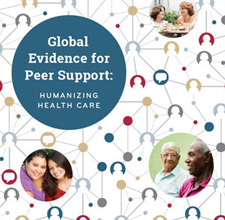 Evidence from projects supported by Peers for Progress shows that peer support is a practical, affordable and humanizing model for health promotion and chronic disease self-management. And why is it important to the present and future of chronic disease self-management, prevention, and health? Peer support programs and organizations – from small-budget volunteer programs to official parts of health care systems – exist all around the world.